You may not know, but I am a Family History NUT. I love it. I find that the more I search, learn, read about, etc. the more I want to scour those resources available to me to find MORE! I even keep two simple family blogs (one for each side) where I add pictures, stories, histories, or whatever I can get my hands on. You see, family history is so much more than collecting names and dates to add to a chart. It's about stories, and individuals. It's amazing how their lives become so much a part of your own when you take the time to piece together their stories. In my life, I've been blessed with some amazingly talented friends. None more so than my friend Crista a professional genealogist and Ancestry.com's "Barefoot Genealogist." I've been lucky enough to spend time learning invaluable insights from her. When I get the chance to see her, our conversations always turn to genealogy. She's helped fan that flame with new ideas - and if you've done any family history, you know that "flame" I'm talking about. 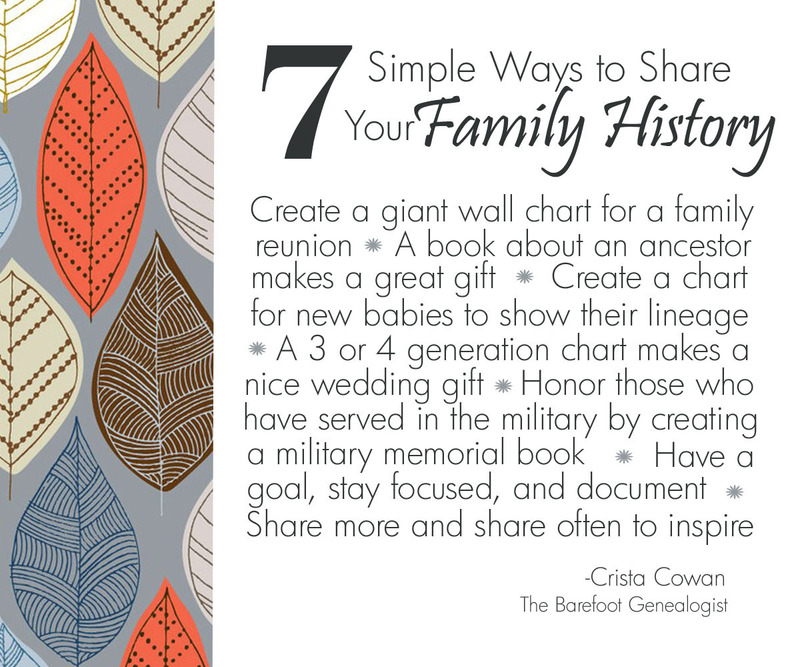 She recently wrote a short article for Ancestry.com called "Seven Reasons To Share Your Family History" It's a quick read and may even give you a jump-start to get going on your own family history! Click over, read it, and get started! Crista is a Professional Genealogist to high profile individuals and "The Barefoot Genealogist" for Ancestry.com. She broadcasts every Tuesday and Thursday at http://www.livestream.com/ancestry if you'd like to learn more about how to do genealogy. You can also view archived presentations on YouTube.